Find below few more examples of Muzaaf Muzaaf ilaihi for better understanding. State TRUE or FALSE: The word نَــبَــاتٌ means plants. This word is present as مُضَاف in the verse Quran (15:18:45). State TRUE or FALSE: The phrase “نَبَاتُ الْأَرْضِ” (plants of the earth) is Muzaaf Muzaaf iliahi in the verse Quran (15:18:45). State TRUE or FALSE: The word وَعْدٌ means promise. 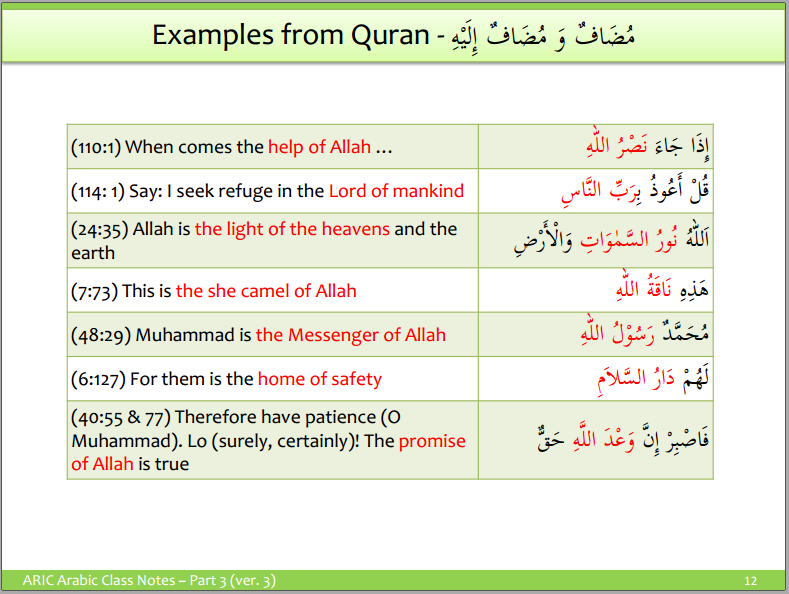 The phrase “Promise of Allah” is translated as وَعْدُ اللهِ. Let us consider the phrase in the English language “His book”. For understanding purpose, it can be rewritten as “book of him”. Thus it uses the concept of “of”. Hence it is also a مُضَاف مُضَاف إِلَيهِ in the Arabic language. So, when the pronoun joins a noun then we get مُضَاف مُضَاف إِلَيهِ . See example below. In the above table كِتَابُ is مُضَاف and is in مَرْفُوع case while the endings هُ, هُم, كَ, كُمْ, يِ, نَا are the attached pronouns. These attached pronouns areمَجْرُور and مُضَاف إِلَيهِ. State TRUE or FALSE: The word اَذَانٌ (ears) is مَرفُوعٌ. The phrase أَذَانُهُم means “their ears”. State TRUE or FALSE: The word قُلُوبٌ (hearts) is مَرفُوعٌ. The phrase قُلُوْبُهُم means “their hearts”. State TRUE or FALSE: The phrase كَهْفُهُم means “their cave”. This is not a muzaaf Muzaaf ilaihi. State TRUE or FALSE: The phrase رَبُّنَا (our lord) is a Muzaaf Muzaaf ilaihi. State TRUE or FALSE: The phrase سَفِيْنَتىِ (my ship) is a Muzaaf Muzaaf ilaihi. The letter ي is Ya Mutakallim (Ya of First person). It is the attached personal pronoun for the detached personal pronoun أَنَــا. Consider the below table. In the phrase بَــيْــتِــي there are two words. Its translation is “my house”. The house (بَيت) in this phrase is مَــرْفُــوْعٌ. But because of the power Ya Mutakallim, the dammah of بَــيْــتُ becomes kathrah. Thus بَــيْــتُ in بَــيْــتِــي is مَــرْفُــوْعٌ. This same thing applies to all the Muzaaf Muzaaf iliahi’s with Ya Mutakallim. Such a thing our eyes cannot see but our mind can see if we understand. 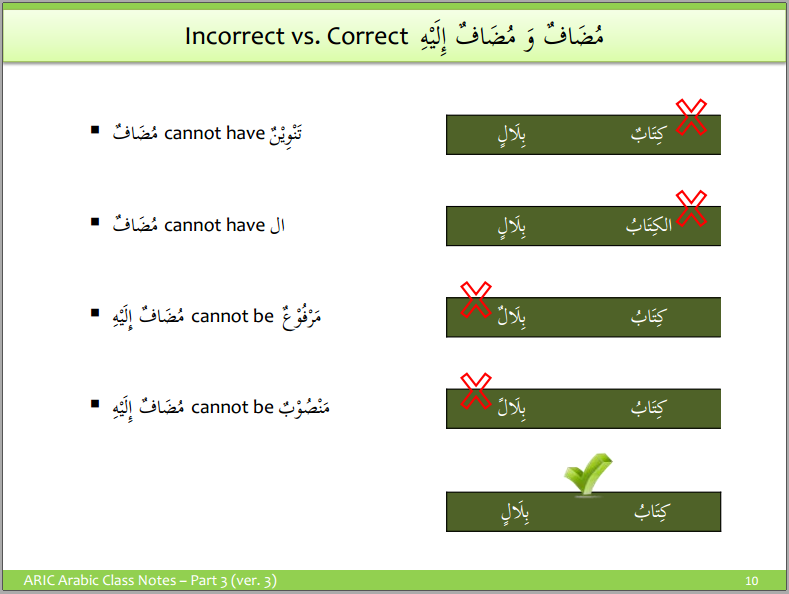 State TRUE or FALSE: The word رَبُّ in the phrase رَبِّى is مَرفُوعٌ. State TRUE or FALSE: The word جِدَارُ in the phrase جِدَارِي (my wall) is مَرفُوعٌ. State TRUE or FALSE: The word حُوتُ (fish) in the phrase حُوْتِــي (my fish) is not مَرفُوعٌ. This is a revision topic. In earlier sessions we have learned Jaar Majroor and Muzaaf Muzaaf ilaihi. Let us derive a simple formula now as below. This topic is very important to understand. We know that, the preposition will make the noun after it into مَجْرُور case. 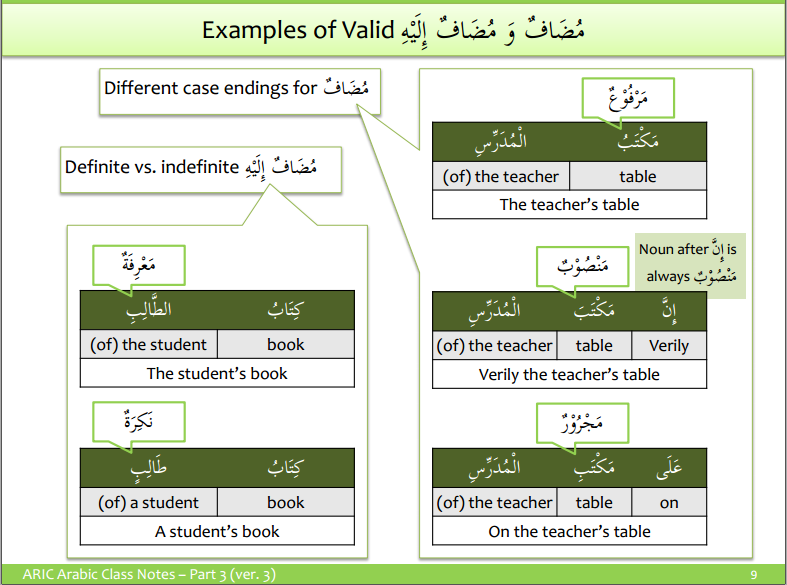 So if preposition comes before مُضَاف مُضَاف إِلَيه then it will make مُضَاف into مَجْرُور case. Example is below. State TRUE or FALSE: The phrase مِنْ أَيَاتِنَا (from our signs/verses) in the verse Quran (15:18:9) has both جَار مَجْرُور and مُضَاف مُضَاف إِلَيه. State TRUE or FALSE: The phrase مِنْ كِتَابِنَا (from our book) has both جَار مَجْرُور and مُضَاف مُضَاف إِلَيه. State TRUE or FALSE: The phrase فِي قَلْبِكَ (in your heart) has both جَار مَجْرُور and مُضَاف مُضَاف إِلَيه.